Moss, Lichens and Algae grows naturally but favours damp, heavily shaded areas. Treated with a propriety of moss or weed killer which can be supplied and administered by ourselves. These products may take some time to work and will be more affective when applied during dry weather. Some treatments leave a residue to discourage regrowth, however if that area is damp and/or shaded it will only have a limited effect. Identify and treat the source of rust stain, to prevent any further staining or a reoccurrence of staining. 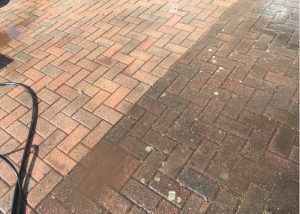 To remove the rust stain from paving, first wet the affected area then apply with 10% hydrochloric acid solution; or a similar proprietary product available from a builders merchants. 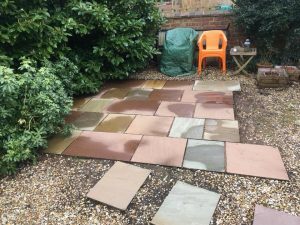 Please note that hydrochloric acid attacks concrete and might etch the surface of your paving, so care must be taken and manufacturer’s instructions strictly adhered to. 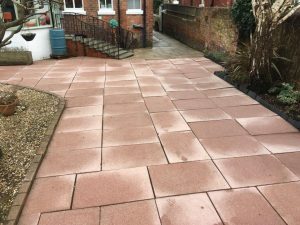 Using acid solutions on block paving is very risky and ultimately can cause burns and breathing problems, always use the correct PPE when using said acids, we always pride ourselves on being compliant with industry HSE, asking us to remove staining from your surfaces means you are in safe hands with competent and experienced tradespeople. Oil will penetrate readily into a paved area and can be stubborn to remove. However, it will not stain if any spillage is removed promptly with an absorbent material like paper towels or cloth. 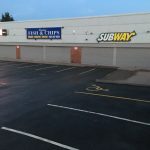 Any oil spillage should be soaked up, not rubbed as this will spread it over a larger area, as well as driving the contaminant into the concrete. If an oil stain persists, the surface can be scrubbed with a strong detergent and then washed away with hot water. Some concrete products may suffer from a loss of pigment so please ensure you take care. For particularly stubborn stains an emulsifying degreaser should be employed. Brush the cleaner onto the affected area, leave for the specified period of time and then wash away with plenty of clean water. Freshly wet paint should be soaked up with an absorbent materials, taking care not to wipe the stain as this will spread the stain. 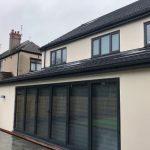 The area should then be treated with suitable solvent, following the manufacturers instructions, before then washing the area with general detergent, insuring care in the disposal of the run-off material. With dried paint, as much of the paint should be scraped off, then appropriate paint remover can be utilised. As before, the treated area should be thoroughly washed, taking appropriate care in the disposal of the run-off material. 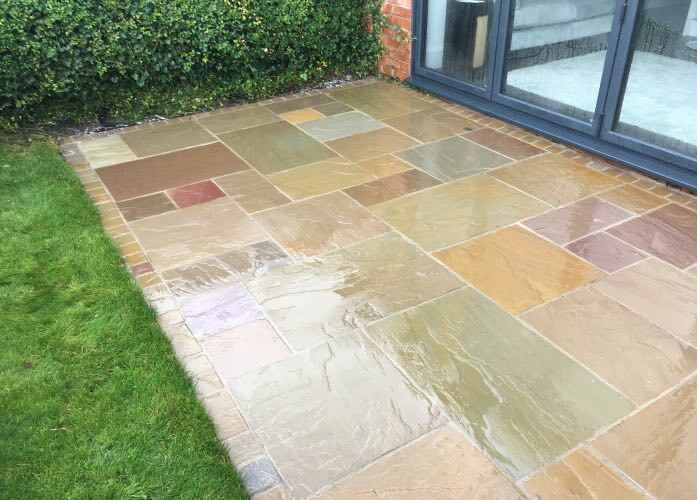 Light mortar stains, which are boned to the surface of your paving during installation, can be removed by using a propriety mortar stain cleaner. Please ensure that you adhere to the manufacturers guidelines. 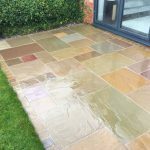 Hydrochloric acid is best used to remove mortar stains and ‘snots’ from paving and brickwork due to its degrading properties and speed of use. Always remember to wear appropriate PPE during and after cleaning. General weathering and wearing of the surface should remove tyre marks over time. However, they can generally be removed more quickly by scrubbing the area with hot water and a strong detergent. Please take care when using this method as it may result in the slight loss of pigment from some concrete products. Always ensure due care is taken in the disposal of the run-off material. 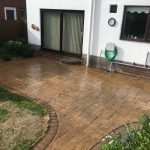 It is also possible to remove the marks using a power wash and correct chemicals to dissolve staining and then wash away safely. Hot soapy water should do the trick here. However, if that doesn’t work, employing a propriety path and patio cleaner and following the manufacturers will remove markings of this nature. Once again, care must be taken with this method, as it may result in a slight loss of pigment from some concrete products. The run-off material should be disposed with care. 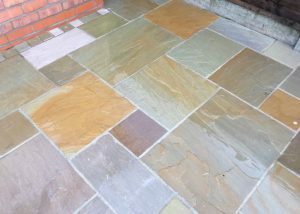 Cleaning of block paving, dependant of type of staining, is a laborious task, made complicated by the use of harsh and toxic chemicals. 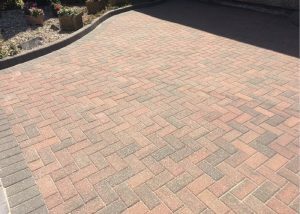 We have years of experience in dealing with many issues affecting block paving and the safe removal of most common types of damage. 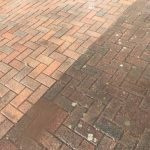 For a free quotation for our block paving cleaning services then don’t hesitate to call free on 0800 920 2027 or use our contact page to send us a message and we will respond as soon as we can.